Spoiler: Tom Brady’s near the top of the list. Every player that makes it to the Super Bowl is important. Some are just much, much more important than others. Both the Rams and Patriots live and die by their quarterbacks. For New England, a sixth NFL championship rests on the 41-year-old shoulder of Tom Brady, who is making his ninth Super Bowl appearance and working for his fifth Super Bowl MVP award. Tom Brady has 2,576 passing yards in the Super Bowl. On the opposite sideline will be a 24-year-old passer making his fourth postseason start. Jared Goff was the first man selected at the 2016 NFL Draft, and he’s rewarded the Rams’ faith by developing into one of the league’s top passers. Now he’ll step onto the biggest stage of his football career and attempt to keep the Patriots from their familiar throne. But while these two quarterbacks will be Super Bowl 53’s headliners, they can’t will their teams to ultimate victory on their own. Both New England and Los Angeles will be relying on star-studded supporting casts — but the most important players on the field might not be the Pro Bowlers and All-Pros you expect. Consider Whitworth the representative of his entire offensive line. The veteran left tackle had a typically solid season in 2018, leading a unit that only allowed quarterback Jared Goff to be sacked 33 times during the regular season. Los Angeles’ 5.06 percent sacks-allowed rate ranked sixth in the NFL last fall. He’ll have his hands full against an aggressive New England pass rush that threw Patrick Mahomes off his game early in the AFC Championship Game. The Pats sacked Mahomes three times in the first half alone, accounting in -43 net yards as the Chiefs went scoreless in the first two quarters. One week earlier, they sacked Phillip Rivers twice and hit him seven more times in a Divisional Round rout. Peters leads a heady group of defensive backs that also includes former All-Pro Aqib Talib, NFC title game cheater Nickell Robey-Coleman, and NFC title game interception-haver John Johnson. That’s a rich vein of defenders who will be tasked with shutting down Tom Brady, a man with 691 passing yards in two playoff games so far. That group, led by the boom-or-bust Peters, helped hold Drew Brees to just 6.2 yards per pass Sunday, turning him into short Brock Osweiler in the process. Now they’re tasked with shutting down another future Hall of Famer in the biggest game of the season. New England’s lack of targets was a legitimate concern entering the postseason, but Gronkowski and Edelman have proven to be as clutch as their quarterback after showing up in a massive way in the AFC title game. The Pats’ WR/TE duo combined for six catches and 106 yards — including three incredibly important third-down conversions — on the three drives that gave New England the lead late in the fourth quarter or in overtime. The Patriots have worked hard to establish their running game early on, using Sony Michel, James White, and a litany of short passes to lure opposing safeties toward the line of scrimmage and jump-start their play-action passing game. Gronk and Edelman may not have an immediate impact in Super Bowl 53, but they’ll be ready when Brady needs them the most on a stage they’re intimately familiar with. The best way to ground Tom Brady’s passing attack in the Super Bowl is to drive him into the ground repeatedly. That’s the blueprint the Giants followed to earn a pair of Lombardi Trophies in famous upsets. That’s what Rams’ defensive coordinator Wade Phillips will attempt to recreate February 3 behind a dominant defensive line led by streaking comet of pass-rushing rage Aaron Donald. Mason, Pro Football Focus’s top-rated guard, is the keystone to one of the league’s most powerful offensive lines. New England hasn’t given up a sack this postseason thanks in part to a dominant showing from the team’s interior blockers — Mason, center David Andrews, and right guard Joe Thuney. That group will be counted on to shut down a defensive line that only ranked 15th in the league in sack rate, but still came up big when it came to making Drew Brees uncomfortable in the pocket, sacking him twice and hitting him seven more times in an NFC title game victory. Stephon Gilmore will earn the assignment covering the Rams’ top receiving threat — either Brandin Cooks or Robert Woods, depending on defensive coordinator Brian Flores’ strategizing. Jason McCourty, resurgent after fleeing Cleveland, will probably handle whoever Gilmore doesn’t cover. That leaves Jackson, an undrafted free agent rookie cornerback, to cover Josh Reynolds and whomever else the Rams throw at him. Reynolds has emerged as a playmaking third option for LA’s high-powered attack, averaging just under 50 yards per game in his last eight appearances but averaging a devastating 14.7 yards per catch. He had five touches for 90 yards to wear down the Saints in the NFC title game, exploiting whatever tiny holes the New Orleans secondary allowed. The Chiefs picked on Jackson Sunday, drawing a pair of pass interference calls and a defensive holding penalty against the first-year player. Sean McVay is going to do the same. But Jackson exceeded expectations in 2018, and New England has a history of getting impressive performances from undrafted free agent rookie cornerbacks in the Super Bowl. Gurley told Josina Anderson after the game that he wasn’t hurt, just having the worst week of his NFL career at a terrible time. That means he should be good to go for the Super Bowl, where he’ll attempt to reclaim the early postseason glory that’s accompanied his rise to fantasy drafts across the world. The fourth-year tailback’s first two playoff games saw him explode for 100+ rushing yards in each of them. If C.J. 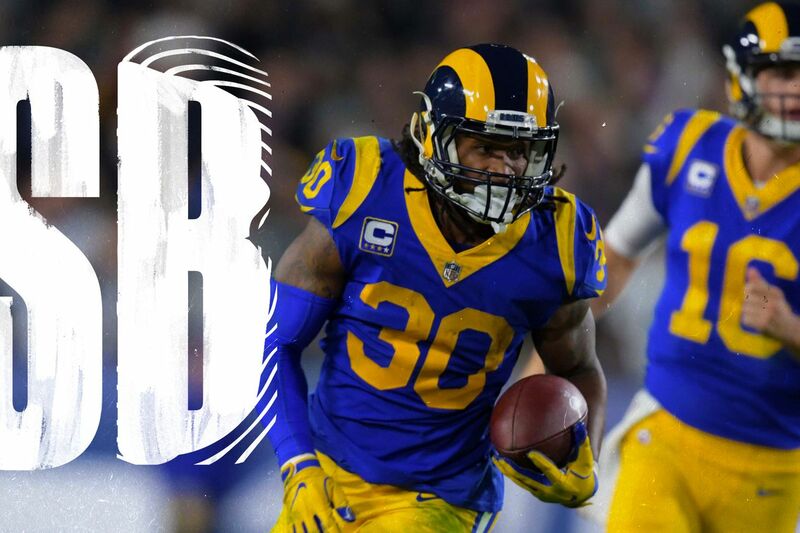 Anderson has another back-to-earth 2.8-yards-per-carry performance against New England, the Rams are going to need their all-world starting running back to cover that deficit and provide the potent counterpunch to Jared Goff’s passing attack. Donald, who will almost certainly be 2018’s Defensive Player of the Year, has been better than almost anyone realizes. He’s also had a quiet postseason. The pocket-crumpling defensive lineman has been held without a sack for the past two games — only his third sack-less streak to stretch into multiple games since November 2016 — but he’s still made his presence felt in the playoffs. On Sunday, he was part of a fierce pass rush forced Drew Brees into an inefficient performance and, most importantly, a game-changing interception in overtime. He’ll take on the playoffs’ top offensive line at Super Bowl 53. The Patriots have been superlative when it comes to protecting their 41-year-old passer so far, keeping stalwarts like Joey Bosa, Dee Ford, Chris Jones, and Justin Houston without so much as a QB hit in the postseason. Goff fulfilled his potential as 2016’s No. 1 overall pick this fall, going from “mediocre” to “good” to “great” and emerging as a bonafide MVP candidate in his third season as a pro. A late-season slump kept him from making a real run at an award that’s almost certainly going to be Patrick Mahomes’, but it doesn’t make his rise from “potential bust” to “franchise quarterback” any less impressive. Goff ranked fourth in the league in passing yards, fourth in yards per pass (8.4), and third among all quarterbacks with four fourth-quarter comebacks — and that doesn’t count his rally at the NFC title game, where he overcame an early 13-0 deficit and led his team 45 yards as time wound down to kick an equalizing field goal that sent the game into overtime. He wasn’t especially efficient in the clutch — he completed only six of his final 11 passes — but he made those strikes count, earning first downs on three of those completions. But after throwing for 300+ yards eight times in the regular season, he’s yet to hit that mark in any postseason. In fact, after recording a 100.8 passer rating this past two seasons, his playoff rating is just 78.9. In big games, he’s gone from an MVP candidate to Blake Bortles. Like it could be anyone else. Any doubts about Brady’s regression from great in 2016 and 2017 to just “pretty good” in 2018 were erased when he led three different fourth-quarter drives to take the lead against the Chiefs in a hostile Arrowhead Stadium. And now he’s back in the Super Bowl, where he’s thrown for 322 yards per game and holds a 98.0 passer rating. Eight previous Super Bowls have lived and died on the throws of Tom Brady. Super Bowl 53 won’t be any different.